(BROOKLYN, N.Y.) -- NEWS: Personal best performances and a record tying high jump marked an exceptional early start to the indoor track season, as thousands of girls and young women from all over the East Coast competed in the opening preliminaries of the 45th anniversary Colgate Women's Games this past weekend (Dec. 15-17) at Pratt Institute this weekend. Sunday in the Elementary B division, 11 Year-old Kiara Davis, a fifth-grader at Wilbur Elementary School in Bear, DE achieved two personal bests--tying the High Jump record by clearing 4'9" in her first time competing in the event at the Colgate Women's Games. Davis also won the 55 Meter-Hurdles in a swift 9.78. Saturday In the Mid School division, four-time Colgate Women's Games' record holder Avery Lewis of Westtown School, West Chester, PA achieved another personal best in the 55M in a very fast 7.12, and also won the 200M in 25.37. Lewis has competed and won first place, setting division records since Elementary A, and has been called the nation's fastest sprinter of her age every year since first grade. Tai Sheppard of Community Partnership Charter School (CPCS) in Brooklyn took first in the 55M Hurdles in an impressive performance and personal record of 8.37. Eyota Bey of Cedarbrook Middle School won the 400 Meters in 1.00.12; and newcomer, Junior Olympic Champion Juliette Salazar from Peekskill Middle School, scored a debut double win in the 800M (2.27.94) and 1500M (4.57.91). Friday, the High School division saw additional opening week personal records from newcomer Rori Lowe of Columbus High School in the Bronx, who won the 55 meters in 7.31; and Manhattan's Mariam Cisse of Harlem Children's Zone who tossed the Shot Put 11.33 meters. Adia Palmer, from Bishop Laughlin High School in Brooklyn, won the 800M (2.23.45). Phoebe Myers of Young Women's Leadership School in Queens won the 55 Meter Hurdles in 8.46; and Brianna Brown of Collegiate Institute for Math and Science in the Bronx won the 200 meters in 25.61. Additional High School and other division results can be found here (results): http://www.colgategames.com/results. Meet Director Cheryl Toussaint said the number of athletes opening the first weekend of events with such exceptional performances may foreshadow a highly competitive season, as she reflected on the truer importance of this 45th anniversary of the Colgate Women's Games. Toussaint said, "The Colgate Women's Games provide girls and young women a means to develop self-esteem and a sense of personal achievement through competitive participation in track and field in a friendly, supportive environment. From thousands of first timers who might not otherwise participate in an organized sport, to hundreds who have developed into the nation's top talent to an incredible 26 alumni who have achieved Olympic fame, we are all most proud of the countless lives changed for the better by the experience of participation. We are so thankful for Colgate-Palmolive Company's steadfast commitment to better the lives of so many through 45 years of support through athletics with a focus on continuing education." Participation in the Colgate Women's Games is completely free. Girls and young women compete within their own grade divisions for ribbons, medals and points. Events include 55 meters, 55-meter hurdles, 200 meters, 400 Meters, 800 meters, 1500 meters, high jump and shot put. Four preliminary meets and a semi-finals at Pratt Institute will determine who will compete at the finals at the New Balance Track and Field Center at The Armory, New York Saturday, February 2, 2019, where trophies and educational grants-in-aid from Colgate-Palmolive Company are awarded to top place finishers in each grade division. Hopeful young track stars, parents, coaches and recruiters can find information about the program and follow results at http://www.colgategames.com/results. 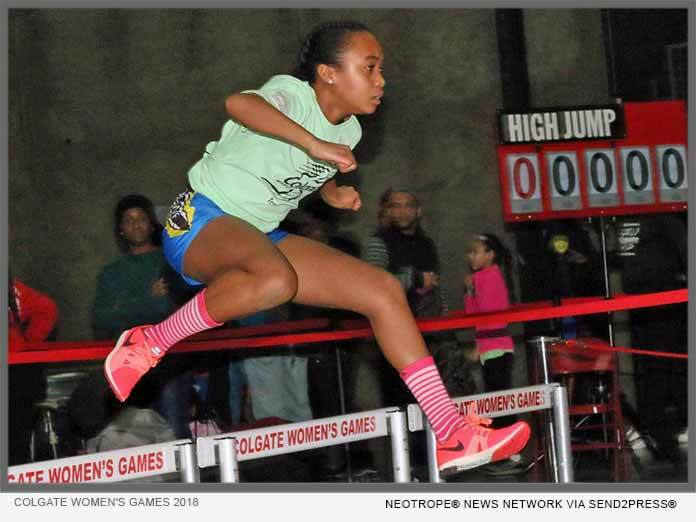 *Photo Caption: Pratt Institute Brooklyn (12/16/18) - Kiara Davis, a fifth-grader at Wilbur Elementary School in Bear, DE wins the 55 meter-hurdles in a very fast 9.78 at the 45th Anniversary Colgate Women's Games. The 11 year-old later tied the Elementary B division High Jump record by clearing 4'9" her first time competing in the event at Pratt Institute in Brooklyn on Sunday.